N00b Squad - "Disney Dreamers"
At one point, my friends and I realized the above and still went to Disneyland...again. We had a big post with pictures about PAX in the last comic if you haven't seen it yet. And I almost forgot, it's the fourth anniversary of N00b Squad this week. 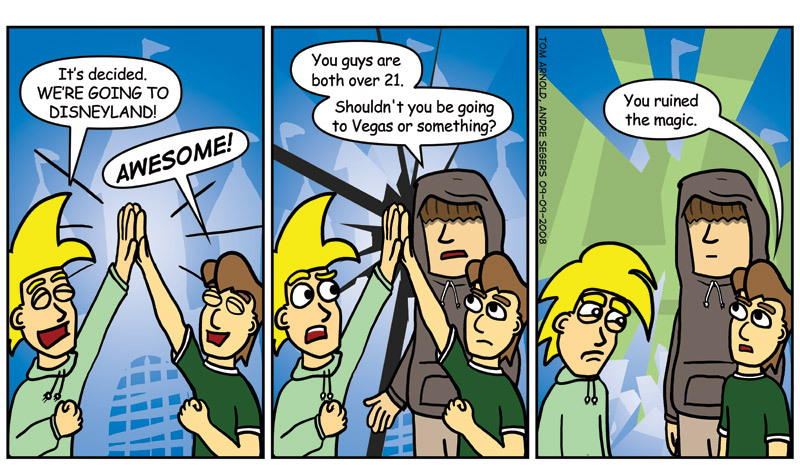 The site started shortly after the Penny-Arcade Expo's first "draw a strip" panel. Be warned: This game is extremely addictive. Sure the game has a Christmas theme but the overall polish is great enough that I don’t worry about it. Andre ended up besting my high-score King of Kong style with three million points and now sits on top of a pyramid made of solid gold. I hope it’s pointy. Seth McFarlane’s now on the Internet and sponsored by Burger King. The King is still creepy in cartoon form. A Robot Chicken paced mash-up of Nintendo cartoons. A lot of work went into this one.